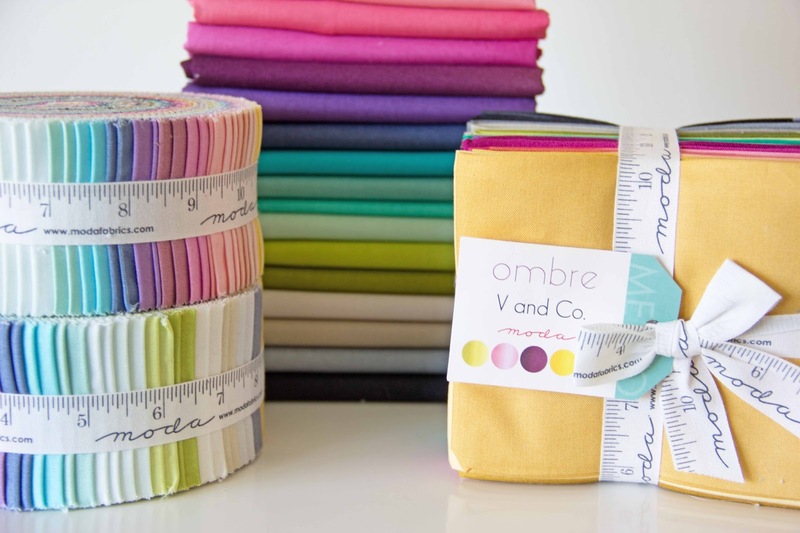 I am so excited to announce a couple of new patterns for our V and Co. Ombre Fabric with Moda! To celebrate I am offering for a limited time 30% off all PDF patterns! JUST ENTER PDFSALE30B at checkout! Sale ends February 2nd at midnight. 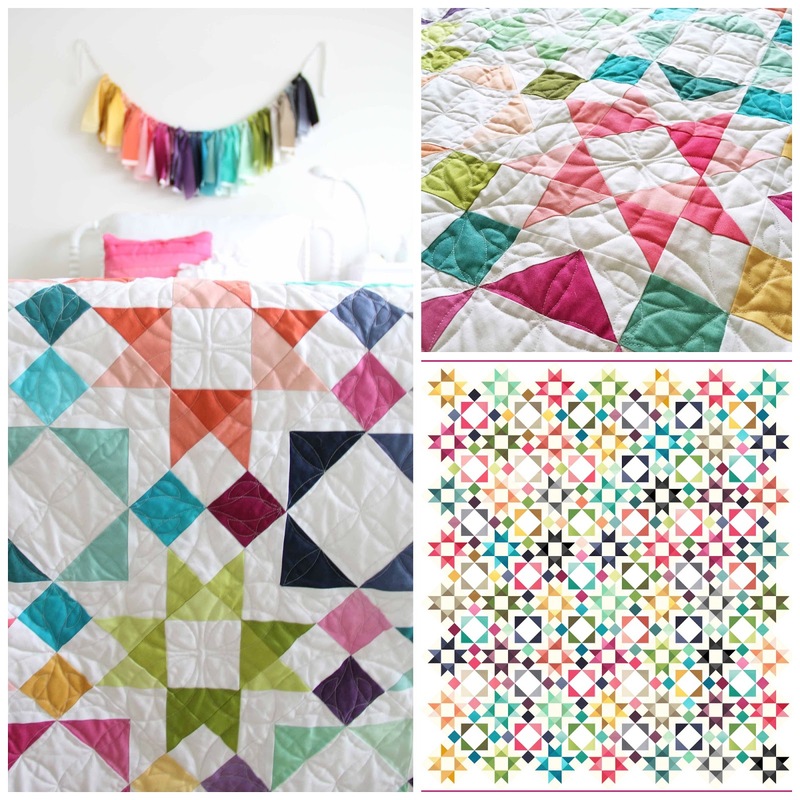 As you all know the fabric has now shipped to your local quilt stores and your favorite online stores! If your store has it in stock tell them thank you for seeing the vision! :) And as promised we are adding NEW patterns to our already existing list of Ombre Patterns and we promise to continue to add more patterns as time goes on! And may I just add, it also comes with Judgey cat approval or sabotage? Well if it has her approval you know you can't go wrong. 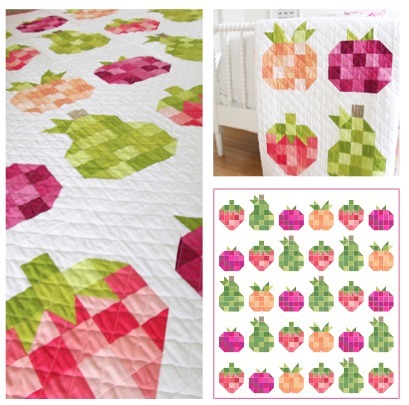 Each of the fruit blocks uses our ombre fabric, and as you can see here with the strawberry block we used the popsicle and hot pink ombre for the fruit and the lime green ombre for stem and leaves. So many shades in just one bolt of fabric! This is why I love this ombre fabric! When it would have taken 6-7 different solid fabrics here you have it all in one bolt! AWESOME SAUCE. And word to your muttha. Quilt finished size is 79" x 83" This pattern includes step by step instructions with color illustrations, pictures, diagrams and template. Find Fruit Salad PDF here. 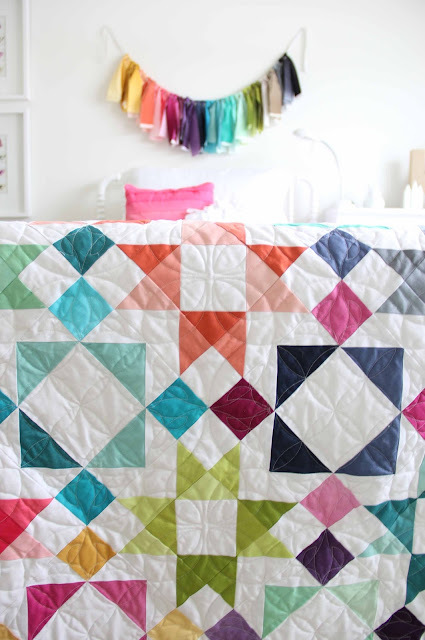 I've said it before and I'll say it again: you can use this Ombre Fabric in any quilt pattern to give it a bit of oomph and character! 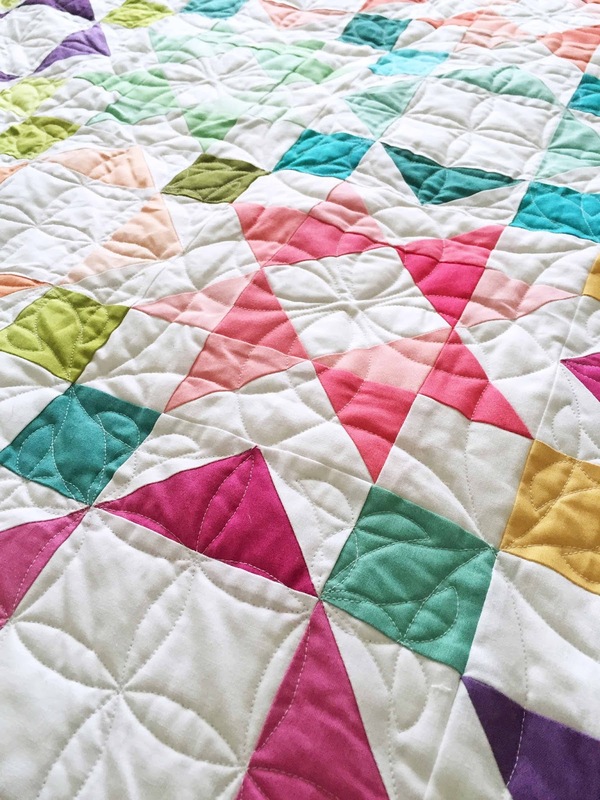 When used in traditional quilt blocks the fabric takes on almost a hand dyed feel to it because of all the different shades and movement it gives the colors! 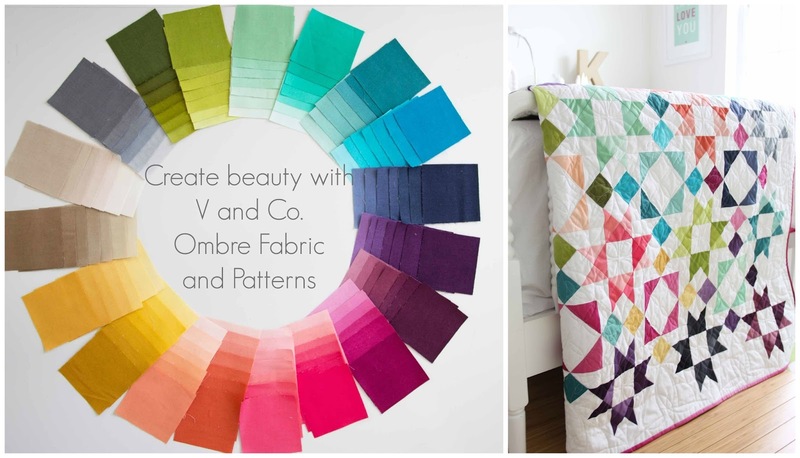 This quilt uses all 20 colors of our V and Co Ombre. And they look beautiful together! 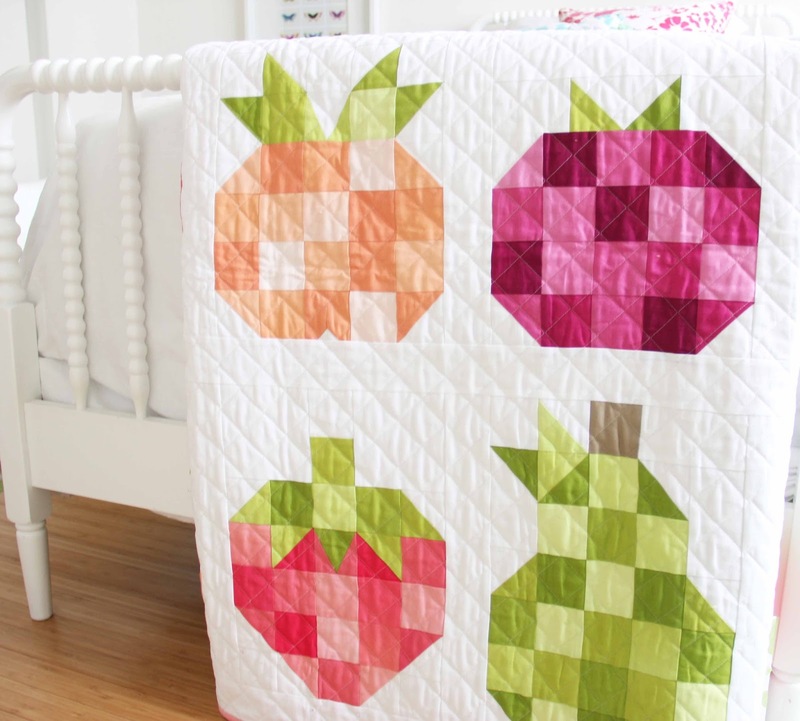 This Quilt comes in 3 different sizes! This pattern includes step by step instructions with color illustrations, pictures, and diagrams. Find Moroccan Getaway PDF here. get 30% off all PDF patterns with code PDFSALE30B offer ends February 2nd at midnight. Okay well go to it, enjoy! I'll just be over here trying not to get in the cat's way. We'll talk soon. Come check us out on Instagram! So glad you've learnt your place and are staying out of the cat's way! 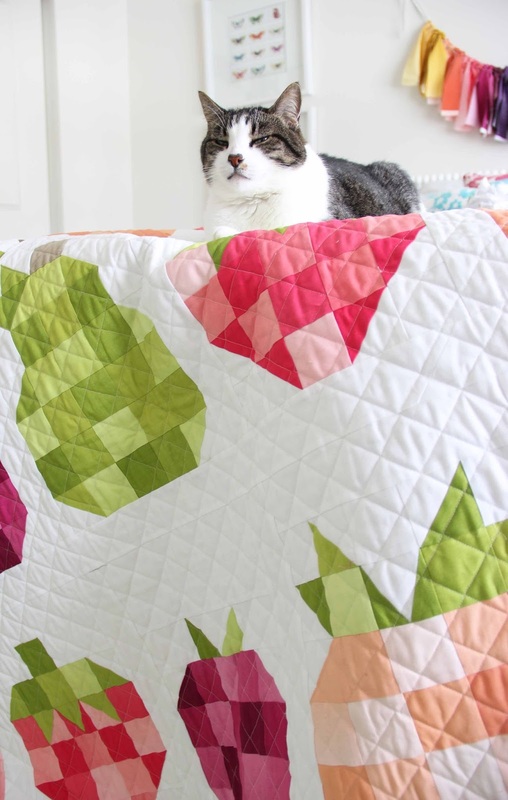 She lets you live in her house you know and she's making the best she can of all those quilts. It's like a magnet and irresistable force compelling her to lie down. Love the fruit, summer here. Love the new range of ombre, fabulous. If the cat gets too much I'll send her a plane ticket she can come visit. 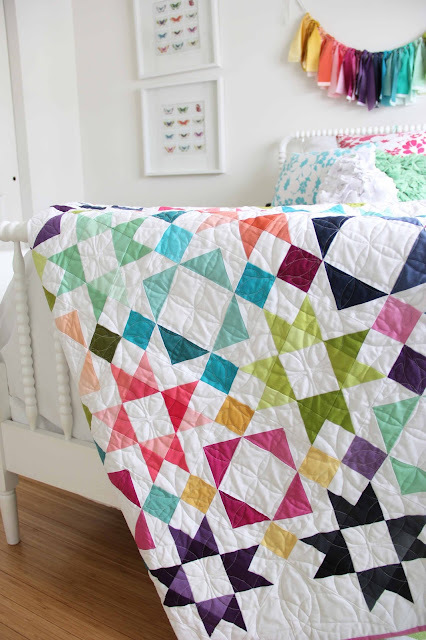 Where can I buy the ombre fabric to make these gorgeous patterns? Those patterns and fabrics are just stunning.Reminds me warm and sunny days. The fat quarter shop has my whole range! Just search "v and co Ombre" and it will pop up! Yes I can't wait for sunnier days!! Moroccan Getaway is gorgeous!! Love it. Thank you! I quite like it myself as well! LOVE your new patterns and the ombre fabric!!! Love the rush hour pattern, and the rising star pattern... Not sure which one to do! I already have my half yard bundle purchased! V and CO OMBRE IS HERE!